Laser Dentistry - no drill needed! One major fear of going to the dentist is the sounds, smell and sensation of the drill. For children, this fear can lead to developing poor dental habits. Dr. Pacella knows it is important to ease those fears and make dental treatment easier for a child. Dr. Pacella utilizes a waterlase laser, an innovative method that is revolutionizing dentistry for children. For most cases, the laser eliminates the shot that numbs the tooth, the feeling of numbness that goes along with it and takes away a lot of the fears that children associate with the dentist when getting a filling. Being able to take this fear away encourages children to develop better oral hygiene habits that will last a lifetime. 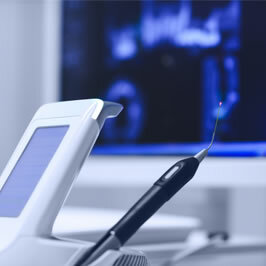 Using laser energy combined with water to remove decay and prepare a tooth for a filling, often without being numb. All you will feel is water and the occasional warm sensation from the laser. Most children do best when combining laser dentistry with nitrous oxide sedation or laughing gas.